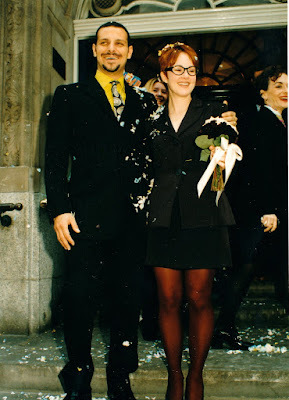 In 1996, we moved to the sceptr'ed isle. Piero flew over first and started looking for places immediately. One night he called to tell me he had found a rose-colored carriage house in a mews in Notting Hill. Me: (interrupting) Stop! You need to concentrate. Is it Camilla Nickerson? Because she is my total style icon. Me: (trembling) Oh my God. Do whatever you have to. Just get it. But despite its shiny new coat of paint, the house still heaved with character. 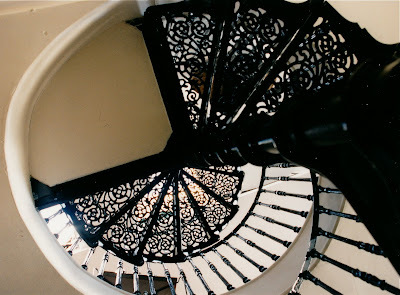 A lacy licorice-colored staircase soared through the middle of each floor from the ground level up to the third floor attic. The centuries-old floorboards were stained a golden honeycomb color and, like a battered leather satchel, gleamed with a patina of character that only a long march of years can provide. Design-wise, I was in the throes of what I now refer to as my "Hogarthian" phase: out with the new, in with the ancient. I haunted Portobello Road for cheap second-hand treasures and then set about giving them a new life, hand-sewing cushions, embroidering pillow covers and even reupholstering them (hello, staple gun). Tea, bourbon biscuits and Radio 4 kept me going. At night, when friends came over and the candles were lit, the house did radiate an enticing shabby grandeur. 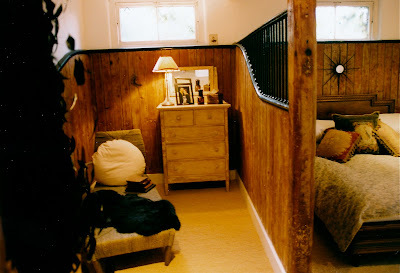 The bedroom was on the ground floor of the house, and in an inspired renovation decision, the owners had left the stable stall up which bisected the room in two. The bed fit perfectly on one side and on the other, I created a little reading area. One late night I heard a noise and looked up to see a feral-looking silhouette in the window above my head. "Most likely a town fox," my neighbor said. "Absolute rascals, they are." Town fox. The words reverberated in my head for days. ...I was afforded a rose-colored glimpse onto the lush, private gardens of the massive town houses that faced Ladbroke Grove. It was a fantastic wonderland of 19th century conservatories and Victorian follies and deliriously unbridled foliage. If I squinted, there was almost no clue that the 20th century (or even the 19th) had arrived. It was during this time that I found my beloved WWII-era horseshoe bench (just visible behind the dining table). I had gone to Bermondsey Market at 5am and spotted it there in the pre-dawn darkness. For £60, it was mine. The painting is by E. L. Blumenschein (1874-1960), one of the famous Taos Painters, although I think it was painted during his Hudson Valley years, before he headed West. 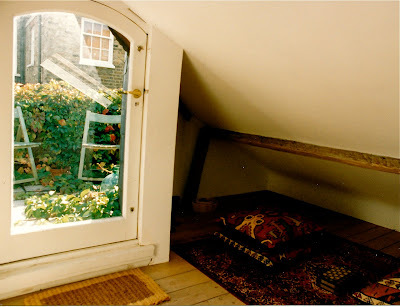 Up on the top of the house was a half-floor that we turned into a tiny (and I mean tiny) lounge. Outside was our very own private garden. Piero cobbled together some wooden planters and we grew an aromatic variety of herbs and encouraged the ivy to fulfill its long-held ambition of becoming a wall-to-wall carpet. Sometimes at dusk, we'd eat our dinner up there, surrounded by smudgy clouds and blue-grey slate rooftops and a ragtag assortment of Victorian chimneys. This is us as we were then. Eagle-eyed viewers will spot my friend Jane in the background. Update: A few of you have asked if I still keep in touch with Jane and Mary from my last post. I do. Mary has moved back to England but Jane still lives in Brooklyn and both are busy raising families and pursuing artistic ventures. Two years ago, we all rented a house in Yorkshire and it was wonderful beyond words to see our children galloping across heathery moors, rolling down hills and scoffing sweets together like there was no tomorrow. Also, it's Friday, which means my new column is up at W Magazine. Click HERE to read it, but not before I wish a wonderful Valentine's weekend to everyone. Do we not get the story of how you met your very Divine Italian? That bedroom might have turned out badly, since it bisects the fairly small space available. Instead it looks terrific. 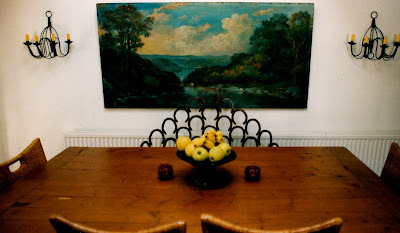 Lisa, I'm crazy about the E. L. Blumenschein and really happy to know the story behind your horseshoe bench. Hels: You are SO right! Love these glimmers of your cool days now and then. You will always be cool in my book! I really have a feeling when your son gets older he will be so happy to know he has such an amazing mother. I'm green with envy! Jesus, Mary, and Joseph... Lisa, darling, your life is like a buzzing bug light, and I am an interested mosquito. Okay, perhaps a poor metaphor, but I am intoxicated by your life. Thank you for sharing. post script: I'm wildly in love with the William and Glen "Highlander" picnic basket! HAPPY VALENTINES DAY you beautiful, beautiful woman! Everyone should have a Hogarth period. It makes the story of one's life so much more interesting. I really love these reminiscence posts you've been doing - especially since you have photos to accompany them. It's so much fun to see the romantic places you've lived before & hear what you were occupied with back then. Thank you! Loved the post. The Hogarth painting is perfect. It is also really fitting that you got married in the Chelsea Registry Office. Nice that your hubbie knows you so well!! Pamela Terry and Edward: I so agree...whether you call it "Hogarthian", "William Blakean", "Samuel Johnsonian" or "Hawksmoorean', it elevates mild penuriousness to a much more romantic level! So charming, or charmed, either way. I didn't know that people like you really existed. Serious, I didn't. 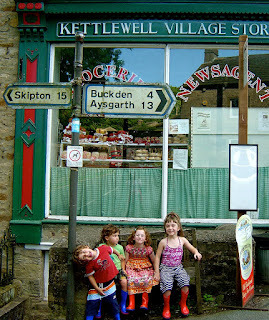 How interesting your photo of the children in Yorkshire. I was just watching a re-run of "the Calendar Girls", which was based on a group of WI ladies from "Knapely" in Yorkshire, which was the fictional name for Kettlewell. The "15 miles from Skipton" road sign looked all too familar! Of course it's entirely charming: and I'm sure even more so with the happy memories you had there as part of a young couple :-) That view! And hidden away like that -so romantic! What a cute place....England in the 60's must have been really fabulous. Loved your column at W btw...Happy weekend Lisa, xv. 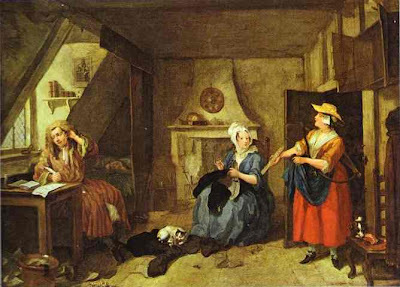 Lisa, what a divine post, the house is beautiful, loved your Hogarth period. I know exactly where that picture of the children was taken, as I originate from that corner of the world. I agree with Laura, I think your going to have to tell us the story of you and Piero. What a beautiful house & lovely story! Now we want to know it all....do tell, please!!! It's beyond lovely to hear your stories! Dear God in Heaven - please, I must own a book by Lisa B.G. Give her the sign...she is to start her book today. Lisa, looks like we were both living in London at the same time. In fact I was working in Nottinghill at Wild at Heart (1997), florist on Westbourne Grove. Wow, I wish we had crossed paths. How utterly darling and gorgeous your home was... beautiful. And 'Town Fox' - love it!! Some people are just 'style personified' and you and Piero are it really. Now tell me what albums he worked on at EMI. Goodness, you are cool. My first flat share was in the same neck of the woods but not in the glitzy bit you were in - I was in Blenheim Crescent, about halfway down Portobello. We were more shabby chic - with the emphasis on the shabby. Transported once again...can I come back as you in my next life?...such serendipity! Oh my, this might be my dream house. I spent a summer as an intern at the British Museum and lived in a dorm room on Evelyn Gardens in South Ken. I would day dream about living in a mews house as I walked to the tube in the morning. Thank you for this peek into your world! And we'd all love to hear about how you met the Divine Italian! 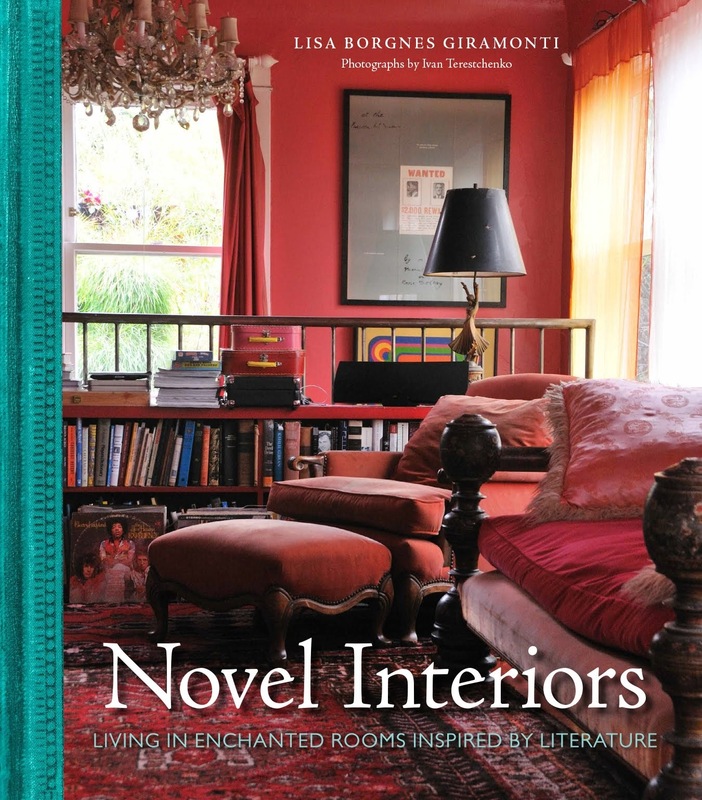 Lisa, I adore your story and pictures of your house. What a feast for us!! You are one of the most creative souls! 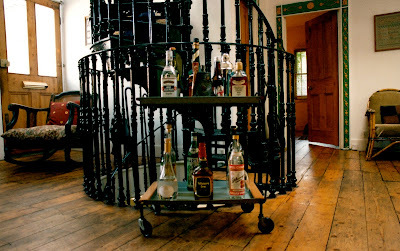 The way you decorate the house (it's so English). If you believe in reincarnation, I think you were a genteel English lady ("Angel in the house") in your past life! Oh that wedding picture, the divine Italian and you looked so stylish and elegant...love the outfit! ONLY the divine Italian could pull off this yellow shirt and quirky tie!! A match made in heaven! Brilliant. 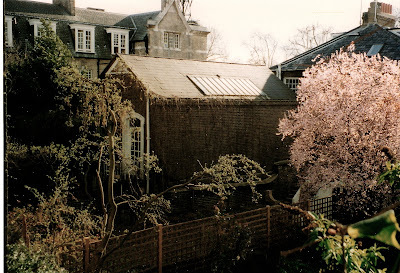 A mews stable cottage with a garden with a cherry tree in bloom. Glorious. Yes, please. Just how did you meet your Divine Italian? Haha, I just had to laugh at French Fancy's comment. And I am curious too... any uncool doings on your part? Keep these wonderful stories (and pictures!) coming. A terrific piece. What a house. Encore please. 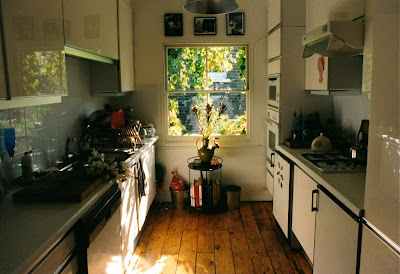 I love the cute little kitchen. what a fantastic home, and so beautifully evoked in your writing. this series definitely inspires me to keep a good photographic record of every abode i nest in, no matter how modest (currently: a pocket-sized chambre de bonne with a grimy shared WC down the hall...shudder). love your blog, and congrats on the art show! In all honesty I'd never heard of Breitling Watches until I went into a store to buy a Navitimer Watches ， everyone I knew seemed to be wearing Breitling Windrider and it seemed like the ideal watch that could be worn both formally and for sport. Anyhow, while I was in the department store looking at the Tag collections, the assistant said, that if I liked Tag, I might also be interested in Bentley Motors T .
The kind of look that makes all eyes turn in your direction then don't look further than the Christian Shoes . These are Christian Louboutin Pumps that will allow you to be able to add the right kinds of style and fashion in one of the easiest of ways possible to come by. Go right ahead and make way for the latest Christian Louboutin Boots in runway trends. If you select the Christian Louboutin Sandals color black you can stick to it. ED clothing make a perfect gift for near and dear ones and the person is sure going to love it. The designs and colors are so attractive that hardy shirt give a beautiful as well as graceful look to the wearer. 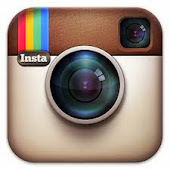 Celebrities also like hardy shirt for the enhanced and sophisticated look along with the glamorous and trendy one. It is up to you what design you choose from the cool collection of ED Hardy Shoes . 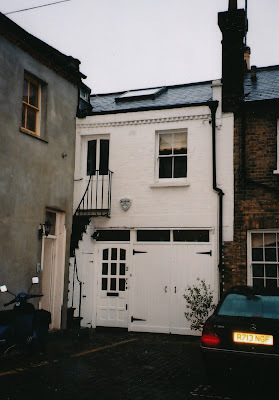 I stumbled upon your blog by googling my old address: 7 Wilby Mews. We lived there from 1990-1992 and our first son was born there. We are back in the States now, but our latest dog, an English Cocker Spaniel who was imported from a great family in Gloustershire, is named Wilby in honor of our London home. We would have been just around the corner to the right of your front door. What a great pub on the corner, too. Great memories. You're so lucky, Lisa! The place is heaven.. I like how the hardwood floors and windows were installed. It's like a classic fairytale. It's been a dream for me to own a house in London. I grew up here in Tampa, and I think it's nice here, too. With all the beaches and the sun. So I wanna try somewhere new. Lovely photos, btw.